1 Mix mango, jalapeno, onion, cilantro, vinegar, brown sugar and ¾ teaspoon salt in a small bowl. Set aside. 2 Place squash cut-side down in a microwave-safe dish. Add 2 tablespoons water. Microwave, uncovered, on High, until the squash is tender, 10 to 14 minutes. 3 Pound chicken with the smooth side of a meat mallet until about ½ inch thick. Sprinkle with ¼ teaspoon salt. 4 Heat 1 tablespoon oil in a large skillet over medium-high heat. Cook the chicken until an instant-read thermometer registers 165°F when inserted into the thickest part, 3 to 5 minutes per side. 5 When the squash is done, use a fork to scrape it from the shell into a medium bowl. Toss with the remaining 1 tablespoon oil and ¼ teaspoon salt. 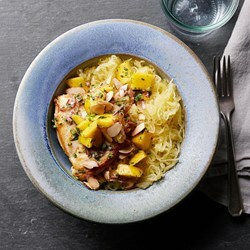 Serve the squash with the chicken, topped with almonds and the mango salsa.